Eagles coach Doug Pederson watching his players warm up during practice Thursday. Good morning. The Eagles will practice today at 1:20 p.m. to continue preparing for Monday night's game against Washington. Pay attention to the status of Michael Bennett (foot), Jordan Hicks (calf), Avonte Maddox (ankle, knee), Jalen Mills (foot), and Jason Peters (personal), all of whom missed practice yesterday. Nigel Bradham (thumb), Brandon Brooks (ankle), Tim Jernigan (illness), and Darren Sproles (hamstring) were limited at the session, so they could show progress today. This is the Early Birds newsletter, which will arrive in your inbox Monday through Friday for the rest of the season. I want to know what you think and what you want to read, so send me feedback by email or on Twitter @ZBerm. The Eagles enter December this season in a far different situation from how they entered last December, when they had established themselves as one of the NFL's heavyweights. Doug Pederson's been asked often what's different this season, and he offered a thoughtful answer Thursday. He didn't say the words "Super Bowl hangover," but there were parts of his explanation that would suggest the Eagles are dealing with some of those symptoms. "I've been in this business and the NFL for a long, long time, and I've seen teams that have had success and teams that have success and then they struggle the next year, very similar to what we're doing," Pederson said. "I think it just proves the point. I think to coaches, to players, that, we talk about everything matters, every little thing matters, the way you attack your off-season program, the way you practice in training camp, how many padded practices — there's a mindset. There's a mentality that has to go along with winning. And along with winning comes people tugging at you to do other things and maybe take you away from your job or whatever you're focused on with the team, and so there's a little bit of that." Pederson then mentioned how the Eagles lost "some players" in free agency and the culture that was established must be recreated. Then he noted how the Eagles have endured injuries at different points of the year, some related to last season. Carson Wentz and Alshon Jeffery didn't start the season. Other players missed time during the offseason, too. Combine that with injuries that came up during the season, and the Eagles have been undermanned often. 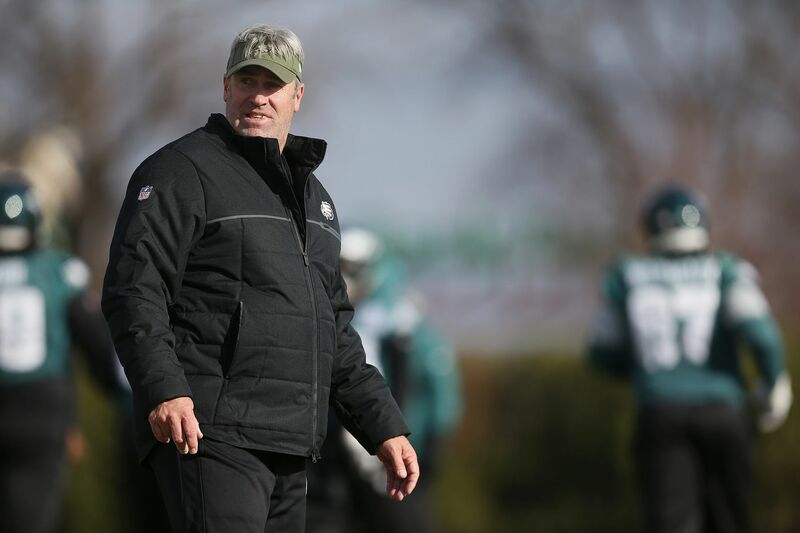 "I'm not going to use those as excuses because we have to make sure that everybody's ready to play," Pederson said. "But all of that can sort of feed into either the success or a struggle, maybe, that a team has, but you still want to — and I think this is the thing that our team realizes, is that you still control your own destiny. We know what's ahead of us. It's a long road. We know that. It's going to be tough. Nothing's guaranteed. Nothing's easy. We just have to approach them one game at a time." There's been much discussion this week about getting different players the ball on offense. Alshon Jeffery's targets are down in recent weeks. Same with Nelson Agholor. The Eagles want Dallas Goedert involved. How's Golden Tate being integrated into the offense? Plus, the Eagles must run more, right? There's only one ball, and Carson Wentz touches it every play. So it's often on him to make sure every mouth is fed. "You want to," Wentz said. "Sometimes it's a play call that might dictate to try to get guys involved. But it can be so hard sometimes, too. You don't want to force-feed anything. I know when you have a lot of weapons it's really my job and Coach's to distribute the ball well, and within each game it kind of just changes. You have to take what the defense gives you." The one player whose targets have remained consistent has been Zach Ertz, who's on pace for a career season. Wentz and Ertz have a strong connection. They send each other clips throughout the week and discuss the nuances of plays and coverages. Just knowing he's going to be in the right spot, he's going to find a way in zone coverage," Wentz said. "Plays with a lot of feel. One of the smartest guys I've played with before. Just having that chemistry is what's building and taking us to where he's having the success he's having." Dallas upset New Orleans on Thursday night, which was bad news for the Eagles. Every win and loss matters with how close the records are right now. The Saints had been a juggernaut, and if the Cowboys had lost Thursday and the Eagles beat Washington on Monday, the Eagles could have been playing for first place next week in Dallas. At this point, the Eagles can still tie Dallas with wins in these next two games, but they're going to need to win some non-division contests, too, if they hope to make the playoffs. Given the way they're playing, the Cowboys must be considered the favorites. Here is the remaining schedule for the Eagles, Cowboys, and Washington. Carson Wentz throwing a pass during practice Thursday. Help is on the way in the defensive backfield with Rasul Douglas and Sidney Jones, but the Eagles are still missing key players. Darren Sproles returned to practice Thursday, Les Bowen writes. Jeff McLane breaks down the film to show why Carson Wentz and the Eagles have struggled with the deep ball. How's Golden Tate coming along? Bob Ford explores. In Paul Domowitch's notes, he looks at Josh Adams as the No. 1 running back and Fletcher Cox's play this season. It looks as if Rasul Douglas and Sidney Jones will be back against Washington. Jalen Mills and Avonte Maddox will take more time. It's possible they're back for Dallas, but I don't know that yet — there are no clear timetables for their injuries. You're right about your assessment of what's ahead of them. Washington doesn't have the most imposing group of wide receivers (it will challenge the Eagles with tight ends and running backs out of the backfield), but look at the three games that follow. Dallas has Amari Cooper, Los Angeles has Brandin Cooks, and Houston has DeAndre Hopkins. My guess is the Eagles' starting defensive backfield this week will be Douglas and Jones on the outside with Cre'von LeBlanc in the slot, and then Malcolm Jenkins and Corey Graham at safety. When Mills and Maddox return, I'd guess Mills and Jones will start on the outside, and then Maddox will play safety in base defense and slot cornerback in the nickel formation.